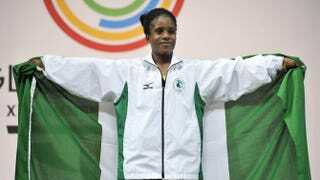 Nigeria's gold medalist Chika Amalaha celebrates on the podium at the medal ceremony for the women's weightlifting 117-pound class during the 2014 Commonwealth Games in Glasgow, Scotland, July 25, 2014. On Friday a 16-year-old Nigerian weightlifter became the youngest female to win a Commonwealth Games gold medal in the 117-pound division. On Tuesday officials suspended Chika Amalaha for testing positive for banned substances, the Associated Press reports. According to AP, Chika "tested positive for diuretics and masking agents" after officials tested her "A" sample and found traces of amiloride and hydrochlorothiazide, both of which, AP notes, are banned by the World Anti-Doping Agency. "It shows we have a very robust anti-doping program in place," Commonwealth Games Federation chief executive Mike Hooper said. "It sends a strong message to anybody in any sport that if you go down the path of doping, any substance to enhance performance, they will be caught … it's an ongoing battle." The Commonwealth Games, an international athletic competition involving members of the Commonwealth of Nations (mostly former territories of the British Empire), are taking place in Glasgow, Scotland, until Aug. 3. Chika has asked that a second sample she provided be tested. If Amalaha's "B" sample, which will be tested on Wednesday, tests positive for banned substances, she will be stripped of her medal. Chika told AP last week that she took up the sport of weightlifting even though her family was against it. "I started at the age of 12, but my family were strongly against me doing the sport at first," she said. "They kept [telling me] to stop doing it, but I persuaded them by getting a female coach. "From then on it was hard work, training, a lot of pain and dedication that got me here today," she added. "And now my family were in the audience, and they are so excited and so proud."